Leon is a master of the obvious. The Dreamcast version also offers a plethora of the PlayStation's unlockable extras, straight from the outset. These include a whole bonus mode which puts Code Veronica's Battle Mode to shame. Extreme Battle is a whole new mission where you must find bombs throughout the Police Department and defuse them. It's an excellent side attraction which will keep you occupied should you get stuck in the game itself (although it does reveal the later locations of the story and so can be a bit of a spoiler). The Dreamcast brings a few improvements over the Playstation, such as VMU screen updates on your health situation and your ammo situation (something lacking from Code Veronica's VMU in-game display). The Dreamcast version also loads a lot quicker, making flicking between rooms a far less annoying process. The blood effects are rather bland. Apart from the addition of the PSX's unlockable extras given from the outset and the marginally sharper graphics, this is pretty much a PlayStation game on the Dreamcast. The voice acting, whilst not quite as bad as the first game, isn't up to the standards of Code Veronica. Also, the rather limited PlayStation character models can't possible hope to emulate the emotion and expressions that the polygon-intensive Code Veronica characters could convey. There are occasional arm sweeps but that's about it, no real facial expressions or mouth movement to speak of. The story is still told well, but it would certainly have been nice to see some better "acting". 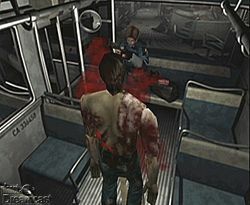 All Resident Evil games, excepting Code Veronica, use flat pre-rendered backgrounds upon which the polygonal characters and items are placed over. 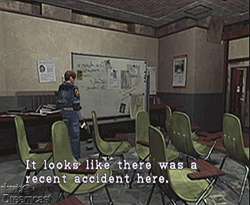 This gives the illusion of depth, however as the backgrounds in RE2 were original rendered for the PlayStation, their resolution isn't too high and they tend to look rather blurry here (a point best identified through playing the game on a VGA box). Thankfully on a standard television the backgrounds look a little better. In fact, the pre-rendered backgrounds offer a lot more detail than the polygonal Code Veronica backgrounds do. A good example of this is the S.T.A.R.S office, which has paper strewn all over the desks and lots of minute little realistic details. Overall, however, the backgrounds in RE2 don't look as good as Code Veronica's polygonally-realised locations. It is disappointing a little more effort wasn't made into sprucing this title up, even re-designing the character polygon models would have been a welcome change, as the square-footed PlayStation models look very dated most of the time. I'd be surprised if the original PlayStation backgrounds weren't derived from high-resolution renders, which could have been used to make better backdrops in this Dreamcast version. Too bad. Lastly, a Resident Evil review simply wouldn't be a Resident Evil review without mention of the game's infamous controls. The control in this game can be highly frustrating but really only if the game is approached in the wrong manner. The game is all about conservation of ammo and items, meaning you don't HAVE to take all enemies out and you should never attempt to take a huge amount of them on up close, unless you have a spread weapon. Code Veronica certainly made this slightly less irritating with the inclusion of a quick-turn function, obviously absent from RE2, but the difficulty mode options in RE2 make getting used to the controls as easy as possible. Control is through the D-Pad with the buttons mapped to use/fire, toggle run, view the inventory, or view the map screen. Those used to Code Veronica will be right at home here, although the quick-turn will definitely be missed. For those who've completed Resident Evil 2 before, this isn't worth getting. However, if you missed out on RE2, are interested exactly how the storyline of Code Veronica came about, and don't mind the semi-dated graphics, Resident Evil 2 is a gripping adventure at a budget price, and definitely worth picking up. Highs: Classic Resident Evil action, all secrets unlocked from start, value price. Lows: No improvements made to take advantage of the Dreamcast, typical RE control. Other: 1 player, VMU Compatible (6 blocks), Jump Pack Compatible.